Brady P. just had his first trip out to High Rock Bay. To get to High Rock, you take an off-road vehicle approximately eight miles past the end of the road. Technically, it's the beginning of U.S. Highway 41, but we usually call it the end of the road because that's where the pavement stops and, once the gravel stops, you're in the lake -- or the bush. The timing of this eight-mile adventure is deceiving. It takes about 35 minutes to get there from the end of the road. Aaron, Brady P. and I went out in the "buggy," properly known as a Kubota side-by-side. In an earlier post, I mentioned that Braeden likes to drive the buggy. Well, Daddy has been giving him a bit more liberty with the steering wheel lately. 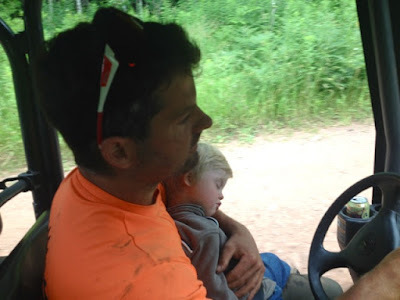 Daddy also has to jerk the wheel back quickly, so we don't run into the trees or the ditch. "Keep it on the road, Brady P!" we shout and laugh. After Brady P. "drove" us over half way to High Rock, the road got rough. We had to slow way down to maneuver through holes, ruts, puddles and uneven ground. At that point, the wee man passed out on Dad's lap. Driving is tough business. He slept the rest of the way to High Rock. But when we got there, it was time for a hike, so Dad woke him up. As any parent knows, waking up your toddler before they are done napping sets a cantankerous, defiant tone for the rest of the day. Luckily we brought Braeden's frisbee, which he loves and carries around like a teddy bear. We threw the frisbee down the trail and all raced to pick it up and throw it again. Otherwise, that kid wasn't walking anywhere. Aaron is a busy man, but when he can sneak family time into his work, he does. His main point of this trek was to check the work his crew did on Phase 2 of the Keweenaw Point Trail. It was exciting for us to traverse the trail that he designed the spring before. It's a unique section because parts of it skirt along the shore of Lake Superior. Aaron surveyed while throwing the frisbee for Cranky Pants Jones. However, I felt that our snail pace wasn't conducive to Aaron's work ethic, so I suggested that Braeden and I sit on the beach and throw rocks while he hiked the rest of the way. That was a good decision for everyone. Brady P. was grateful not to get prodded along the trail and instead feel right at home on a bed of rocks along the Big Lake. He began throwing right away. 1) Look at the size of that rock (captured just above his head). That is his favorite size to throw, and he can throw them far. 2) Look at his left hand. He whips rocks so hard that he has to steady and balance himself, so he doesn't tip over. Nice follow through, buddy. 3) Look at the horizon where the lake meets the sky. See that slightly raised dark area that pans the middle third of the shot? That is Manitou Island. See the tiny dot just to the right of that? That is the Gull Rock lighthouse. The view is better if you were really out there -- or if you had a better camera -- or if you were actually a decent photographer. I claim none of those things. After a good session of throwing rocks in the water, Braeden turned on me. That 15 minute snooze in the buggy did not replace his afternoon nap. Brady P. was becoming out of control of his actions. He started throwing rocks at me. 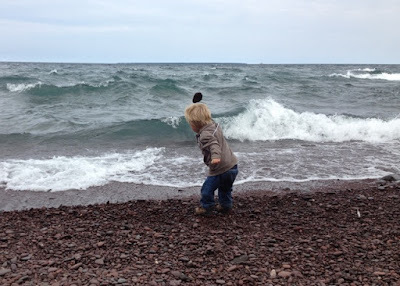 When he throws a rock at me at our usual beaches, I say a combination of things like, "Ouch! That hurts, Braeden. Throw the rocks in the water, please. We don't throw rocks at people." And he knows all that, so he stops. But that day, he didn't seem to care. He knew that what he was doing was wrong, but he did it anyway. I couldn't think of what I did to deserve a pelting of rocks from my son, so I blamed it on the lack of nap. Nonetheless, his behavior was unacceptable. Darn it. You thought little Brady P. was an angel, didn't you? And here I am showing you his dark side. Well, this blog is about life, too. I pulled that little boy onto my lap, laid him on his back and held his hands firmly. I stared straight into his eyes and scolded him. "We do NOT throw rocks at people, Braeden. That hurts Mama. 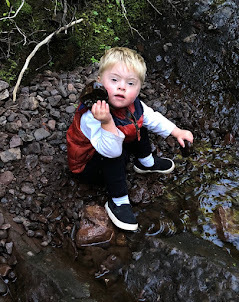 Rocks go in the water." I held him there for a moment, then gave him a kiss and a hug because that is always a good transition. Well, he didn't really want a kiss and a hug this time. Nope. He crawled off my lap and walked back to the bushes and sat down all by himself. Hmm, I thought. He's mad at me right now. But that's okay. He can be mad for a bit. Emotions are part of life, and I want him to be able to express his and know that it will get better soon. Luckily, Daddy came through the bushes a bit later. Brady P. turned into a Daddy's boy on the spot. Geez, make me feel like a bad mom! We sat for a bit longer and ate some fruit on the beach. Then we played the frisbee toss game back down the trail to the buggy. We explored the entrance area a bit more, but Brady P. made it clear that he wanted to go home. That little dirt-faced boy was a bit out of his wits. I couldn't blame him, though. I was getting there myself. It was time to go home, eat some dinner and have a night-long nap.